Rural Trump Voters Embrace The Sacrifices That Come With Support President Trump has proposed spending cuts to programs that prop up rural areas that voted for him. While some policy experts bemoan that, there are rural voters who fully support those cuts. 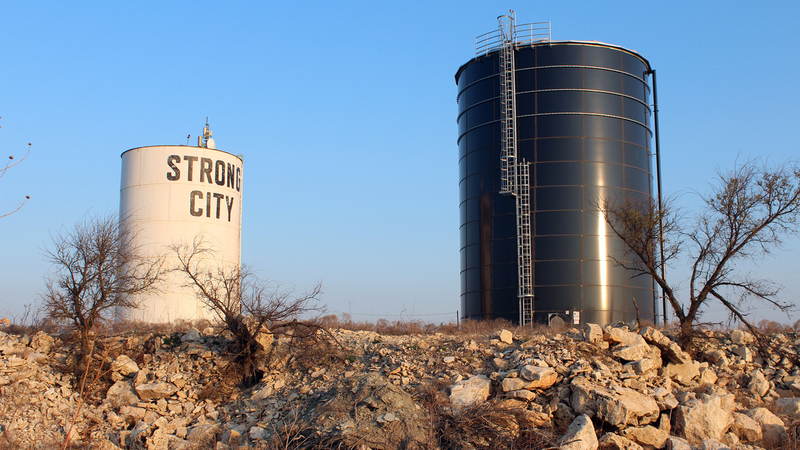 A new water tank in Strong City, Kan., (at right) sits next to one that was part of an old leaky system on a hill just outside the city limits. Some of President Trump's proposed spending cuts would cripple programs that benefit communities full of his rural supporters, but at least in Strong City, Kan., some say they are ready "to bleed a little bit." Strong City is a former railroad town of about 460 people, less than half the size it was in 1890. Trump's proposed budget aims at killing the program that threw a lifeline to the town's water system. Shari DeWitt, the city clerk, says a couple of years ago, even its water treatment plant was dying. DeWitt says the plant was built 40 years ago inside the town's abandoned high school, but the plant kept breaking down. "Water's very important and a lot of people don't realize it until they don't have it," she says. Strong City banded together with Cottonwood Falls, the town next door, to build a $6 million water treatment system. It serves only about 500 homes and businesses. The treatment plant is paid for, and it started operation about a year ago. More than $2.7 million in federal grants made it possible. "Oh, it would have been inconceivable. We couldn't have done it. People couldn't afford for us to do it," says Larry Sigler, who works at the plant. Many of the proposed budget cuts would hit places where Trump got lots of votes: isolated, rural communities, says Johnathan Hladik, who heads the Center for Rural Affairs in Nebraska. "Bewildering might be the best way to describe it," Hladik says. "The more remote you are and the more rural you are, the worse you're going to have it, as a result." If passed as-is, the budget would kill programs that train workers, back small town startups and help pay for roads, sewers and broadband in some of the nation's poorest counties. Tom Vilsack, secretary of agriculture under President Obama, says the Trump administration is packed with urban political operatives and needs an advocate for rural communities "so that someone is pounding the table, as I had to when I was secretary of agriculture, to make sure that people understood how things would impact and affect rural Americans." 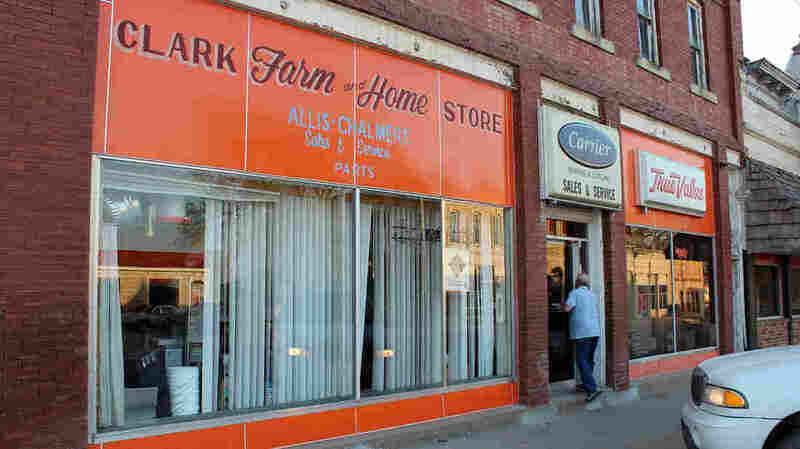 Customers come to the Clark Farm and Home Store in Strong City for everything from Scotch tape to tractor parts. They regularly swap stories about government waste. Some governors are pounding the table pretty hard. And Al Cross, who runs the Institute of Rural Journalism and Community Issues at the University of Kentucky, says lawmakers and powerful farm state senators are also fighting for key programs, like the 50-year-old Appalachian Regional Commission. "We've already seen Mitch McConnell lay down the law that not only is the Appalachian Regional Commission not going to be eliminated, its budget is not going to be cut," he says. They got to make cuts somewhere. Somebody's going to get cut, somebody's going to bleed a little bit. That's just a fact of life, but to get things back into balance. But for all the anger and anxiety over possible budget cuts in policy circles, in Strong City, quite a few people actually embrace those cuts. "They've got to make cuts somewhere. Somebody's going to get cut, somebody's going to bleed a little bit. That's just a fact of life, but to get things back into balance," says Jim Fritch, who works at Clark's Farm and Home Store. Jim Fink runs the store, and he agrees. Both Fritch and Fink voted for Trump. "If you ask me would I rather see the money go for our water plant, or to possibly try to control our borders and the security of our nation, the security of our nation is more important to me," Fink says. Rural communities do have their own pressing needs. Wages tend to be lower and health care harder to find. Opioid addiction and suicide are much more common. Federal programs address rural ills but quietly enough that they can be overlooked by people historically leery of anything coming from Washington.